The issue of Marketing and Sales Alignment has been raging on for several years. We have heard all kinds of reasons why. From sales not receiving support they need, to marketing believing sales is not following up on its leads. We have also heard we have to align with customers and buyers. I agree. I think it is more than that. Let us first acknowledge a big shift. We are undergoing the biggest shift in buying behaviors in many a decade. As I have previously written, in my article, 3 Steps B2B Chief Marketing Offers Need to Take To Survive the B2B Buyer Revolution, we are in the throes of a buyer revolution. A revolution means things topple and calls for important steps to be taken by CMO’s. 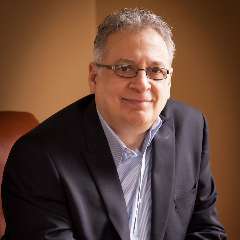 This specific commentary is a sequel to my article entitled 5 Actions Chief Marketing Officers and Chief Sales Officers Can Take to Bridge the Big Insight Gap. Where, I outlined 5 action pillars both CMO’s and CSO’s can take together to bridge the gap in sales and marketing through joint buyer insight-driven strategy creation. When big shifts happen, they usually require shifts in strategy. Which, many organizations are attempting to figure out. To come up with sound profitable strategies today requires new understanding of markets and buyers in the burgeoning digital age. This we are learning as we go. I maintain buyers are evolving at a faster pace than B2B organizations. Resulting in many B2B organizations trying to run as fast as they can on the marketing and sales treadmills. One reason why the alignment issue continues to rage on is both marketing and sales are caught in the midst of this big shift and buyer revolution. Looking for answers. Some strategies, implemented by each team, are working well and some are not. I am not sure this is the best way to go about it. As with many organizations, there is a river of silos, agendas, history, inertia, profitability stress, target pressures, budget pressures, and more flowing between these two areas. To overcome this raging river, which can divide, CMO’s and CSO’s can look towards something more operational. Building a bridge between the two organizations with the solid foundation of a common understanding of buyer insights. Problematic today is quantitative insights, in data reporting formats, resides in two disparate systems – sales automation and marketing automation. Qualitative buyer research, if it takes place at all, originates out of only one area – and maybe not even sales or marketing. Thus, we have no common understanding, of both quantitative and qualitative insights, by which marketing and sales, including customer support, can jointly use to make buyer-informed strategy decisions. The Buyer Insight Bridge™, shown here as a metaphor, represents a new operational view of centralizing buyer insights. Whereby both marketing and sales develop common views and understanding of buyer insights. The result is an alignment through joint buyer insight-driven strategy creation. The greater results are buyers and customers being served throughout the entire buying cycle and the customer lifecycle. I am advocating a centralized approach due to a natural law of business. Usually, when there are shifts in market and buying dynamics, there is a need to develop new strategies. When developing new adaptive strategies to market and buying dynamics, it calls for operational adaptations as well. This is a key law often forgotten. It is definitely not business as usual from an operations standpoint. Marketing and sales will need to look at how they must operate differently to succeed. Like any good building project such as a bridge, it starts with a strong foundation. It can also represent a substantial step forward in achieving Buyer Insight Maturity. I suggest focusing first on identifying the buyer insight needs of both marketing and sales. Agree on common and unique needs. This starts with a cup of coffee between the CMO and CSO. It begins with an open and candid conversation on what you do not know and need to find out. No coffee, no way this gets done as I see it. There must be senior level involvement. 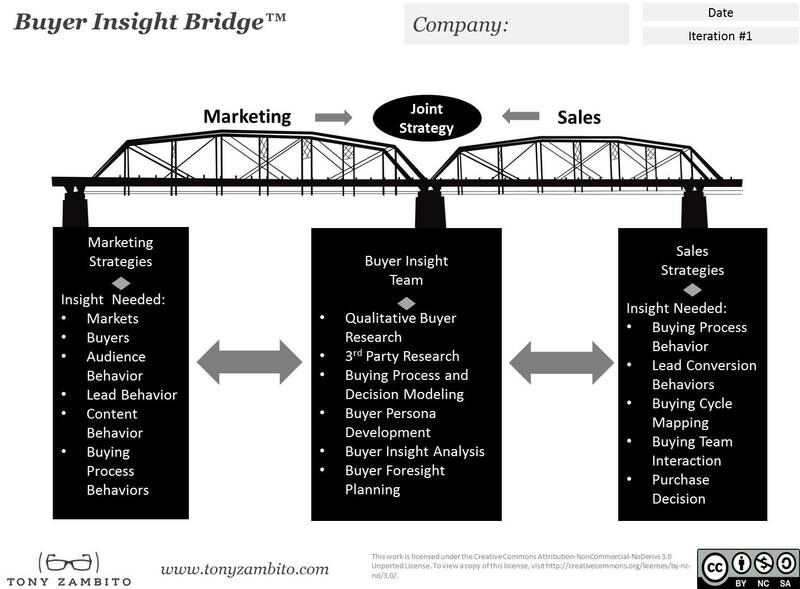 The Buyer Insight Bridge™ serves as a metaphorical starting point. I have listed the obvious key areas. I realize there can be a host of questions, which can arise. I welcome further conversations with CMO’s and CSO’s on this call to action. Invite me for coffee. I am positive we each will learn something new.